Hi, I’m Jen Jones, LP, MA, PsD, a lay nuclear physicist. I know what you’re thinking: a real nuclear physicist needs a PhD (instead of a PsD), must have spent years at a super expensive school like MIT and has to work in a place like Los Alamos in New Mexico where they built the atomic bomb. That’s what most nuclear physicists want you to think. The truth is that you can be a lay nuclear physicist, train by apprenticeship and work at home. Lay nuclear physicists are experts in uncomplicated atoms, like hydrogen and helium. We leave those super duper fancy elements made with interventions (like Einsteinium, Californium and Fermium) to the MIT crowd. They use unnatural interventions to make new atoms. They refuse to let a natural process unfold over tens of thousands of years because they have to get to their golf games. Lay nuclear physics is a calling for me. As I researched atoms for my high school physics class (which I flunked), I found what I can only describe as “signs” that the universe intended that I be a lay nuclear physicist. I’m incredibly proud of my credentials, so proud in fact that I had them monogrammed on my towels. I have an LP (lay physicist) PLUS I did advanced apprenticeship for my MA (mastering the alphabet), and (I’m most proud of this) my PsD (doctor of pseudoscience). My friend has been trying to make her husband even more energetic than mine using atomic fusion (that’s physics-speak for smashing atoms together to make make bigger atoms). She tried squishing her husband’s head in a vise to see if she could make the atoms in his head fuse. It didn’t work; he died. But hey, people die when nuclear physicists are around (they don’t call them atom bombs for nothing). The key to being a great lay nuclear physicist is to EDUCATE yourself and not just blindly except what those pinheads at MIT have to say. You have just as much right to do research with your own atoms as they have to do research with theirs. Education never stops. Even though I have all those fancy degrees, I’m going to a special seminar at Los Alamos next month to learn more. 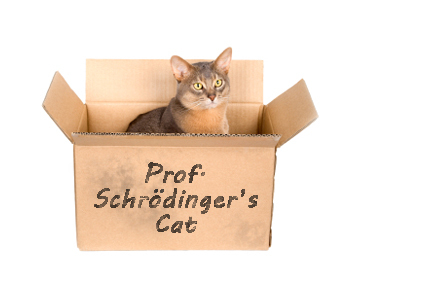 No, not at the nuclear facilities in Los Alamos; I’m going to a Farm outside of Los Alamos where the greatest lay nuclear physicist of them all, Ima Frawde, will lead us in meditating on the beauty of Schrodinger’s cat. Best of all: we’ll be getting new letters to put after our names, CLNPE, certified lay nuclear physicist educator. I’ll have to re-monogram all the towels, but it will be so worth it. ← What does it mean to promote normal birth?